What Makeup Is Safe for Pregnant Women? The FDA has little authority to regulate cosmetics and personal care products. That means women in the US have to do their own research into what is safe, and what ingredients might be linked to cancer, allergies, and reproductive problems. Paying attention is especially important during pregnancy, a time of rapid development for your fetus. If you recently got a positive pregnancy test, you need to figure out which cosmetics you can keep using, and what needs to be tossed. We’re here to help. Read on to find out what makeup is safe for pregnant women — and how you can easily find it, either online, at the drugstore, or in your existing stash. Exposing your growing baby to potentially-toxic chemicals carries risks for your child as they grow older. The American College of Obstetricians and Gynecologists warns that prenatal exposure to toxic environmental agents is linked to cancer and reproductive issues later in life. Such exposure may also lead to low birth weight and preterm birth. In it’s list of 10 tips for a less toxic pregnancy, the consumer advocacy nonprofit Environmental Working Group (EWG) lists “choose better body care products” alongside advice like “don’t smoke” and “go organic.” If you’re serious about having a healthy pregnancy — and healthy child — you must take a look at the ingredient list on your cosmetics. When I got pregnant in February 2017, I did just that. I’m happy to say I found some helpful tools and shortcuts to reduce the risk without too much effort. Endocrine disruptors — chemicals that interfere with our body’s normal hormone function — are the most important chemicals to avoid when you’re pregnant. EWG puts together its Dirty Dozen list of endocrine disruptors, and unfortunately many of these are found in cosmetic products. When you’re pregnant, choose fragrance-free products. Often, brands categorize endocrine disruptors like phthalates under “fragrance” or “parfum” on labels. When you’re pregnant, choose fragrance-free products whenever you can. And skip your signature scent. It might make you nauseated, anyway. While you could memorize the above list, that’s not practical. Here are some tools to make it easier to shop for and evaluate makeup you already have. 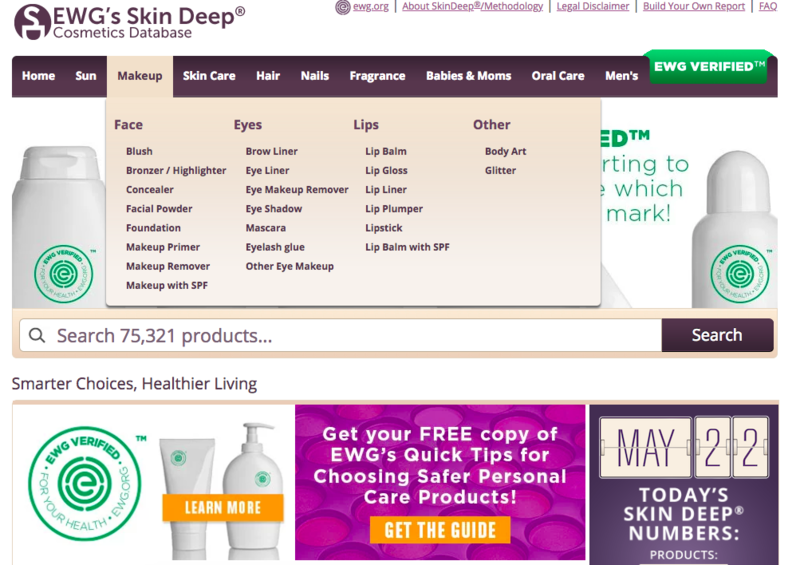 Search EWG’s Skindeep Database to evaluate the safety of specific products. EWG Skindeep Database: You can search over 74,301 products to find out how they rank from 1 (low hazard) to 10 (hazardous). This is a great way to check if your existing products are still safe to use while pregnant. I also like to simply Google: “Product name EWG” to get the same results. EWG Build Your Own Report Tool: If a product is not already in EWG’s database, you can enter the ingredients yourself to get a ranking using this tool. Think Dirty App: Quickly get ingredient info on thousands of products with the convenient Think Dirty App, available on iPhone and Android. Credo Beauty: At Credo Beauty, you can shop hundreds of safe and sustainable products. They’ve also created a Clean Beauty Council of industry experts to keep pushing the beauty industry toward higher standards. There is free shipping when you spend $50 and you get three free samples with every order. The Detox Market: The Detox Market began as a pop up market for clean beauty in Venice, CA. Now they have shops in West Hollywood, Toronto, and on the internet. There is free shipping when you spend $80. Safe Brands on Amazon: Various nontoxic makeup brands are for sale on Amazon. You can check out our favorites here. 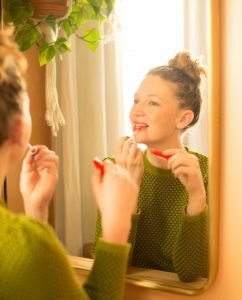 Safe Drugstore Makeup: You can still find nontoxic makeup at your local drugstore. It takes a bit of research, so put the EWG Skindeep Database or Think Dirty app to work. Or, check out our favorite safe drugstore beauty pics. If you’re pregnant, you can make some easy swaps right away — and it will pay off. A study from UC Berkeley found that when teenage girls went just three days without using products with endocrine disruptors, their bodies responded. By simply reading labels and using lower chemical products, these young women lowered exposure to these chemicals. You can do the same. RMS Beauty: With beautiful packaging and products that fill multiple needs, you can’t go wrong with RMS Beauty, available at Credo. Mineral Fusion: The brand sells a ton of products directly on Amazon. Almost all are EWG Verified, meaning they go through a special approval process by the Environmental Working Group. You can also find Mineral Fusion products at your local Whole Foods. Juice Beauty: Juice Beauty makes a range of beautiful makeup basics, available on Credo. Pregnancy gave me the motivation I needed to clean up my cosmetics. I will reap the benefits for the rest of my life. And so will my daughter.